Avvo now hiding your info? I was disappointed to hear on a legal listserve about two weeks ago the whispers of a plan by Avvo to remove contact information from profiles unless the lawyer was paying. I thought perhaps it was a misunderstanding, as it seems that a directory devoid of…. directory information, makes it universally less useful. But now that Internet Brands has acquired Avvo, and Mark is no longer behind the helm…. Of course, that contact information was always a part of the free profile and didn’t require Premium. Apparently no more. With this pivot, Avvo is essentially shifting from being a useful directory where consumers can find the best lawyer for their specific situation to functioning solely as an advertising platform. They have every right to do this, but from a user experience standpoint it would be a disservice to remove essential information from highly qualified attorneys solely because they’re not actively advertising with Avvo. With Google’s focus on user experience – I wonder how this removal of key information may impact Avvo’s performance in the SERPs – will be interesting to monitor over time. I was sad to hear about Mark leaving AVVO but I don’t blame him. I would have done the same – maybe sooner. He created something that worked and filled a niche unlike many other legal sites. Unfortunately, as with most bought out services, the new owners make changes and the product eventually goes away. Danny Sullivan once wrote: “Google Doesn’t Owe You A Living, So Don’t Depend On It.” I think the same thing applies to AVVO. It was nice while it lasted. But Internet Brands is only guilty of following the law of the jungle: monetize everything. I think their latest move will pave the way for other attorney directories and related ventures. But it is inevitable those new ventures will similarly find a way to monetize. Many attorneys are lucky about one recent development with AVVO – the decision to shut down their legal services. I was always of the opinion that half the attorney population would end up employed by AVVO in 15-minute increments. 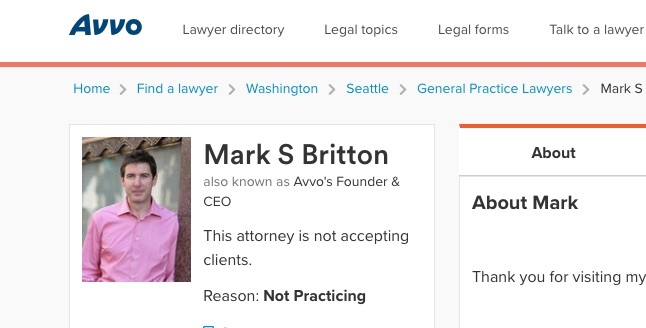 We are better off now that AVVO Legal Services has pulled the plug. Internet Brands has wrecked every legal marketing property they have acquired. Them turning Avvo into a steaming pile of pay for play dung was inevitable.